When Should You Detail Your Car? Car detailing is not as much a luxury as it is a necessity to protect the value of your vehicle. Anyone can fill a bucket with soap, splash their car with water, and wash their car. Detailing is not car washing. Detailing involves going over the tiny parts on your car to remove all of the grime and dust that has built-up and can potentially lead to the build-up of rust and corrosion. Understanding the importance of car detailing is why we are in business. Knowing when you should detail your car is as easy as understanding these points: the ideal time of day to detail your car, detailing your care in preparation for winter, understanding the ideal temperature of your car for detailing, and detailing your car either before a sale (to increase the sale price) or after buying your car (to preserve its condition). The ideal time of day to detail your car is when the sun is not scorching the earth. Think of terms of the best times to mow and water your lawn and apply the same general thought process. You may consider early mornings before 9 o’clock am or late afternoon to early evening closer to sundown as ideal times if you live in an area where midday temperatures are between 75 and 90 degrees Fahrenheit. Detailing your car before winter is a great way to prepare it for the harshness of the winter months. Detailing allows you to remove all of the grime and dirt that has trapped itself in those small areas on the car that washing simply cannot remove. It will also provide you with an additional protective coat to seal out additional dirt and salt that are the inevitable result of snow removal and living in a cold weather climate. Just as important as the consideration of the time of day for detailing is the temperature of the car. A car that is too hot for detailing will be difficult to properly apply any of the cleaning solutions required for an effective detailing. If you have recently driven the car just prior to an intended detail, allow it to cool down properly. You may also consider putting the car in a covered or shaded area for maximum effectiveness. Whether you are selling or buying a car, detailing is ideal for bringing out the luster and shine of your vehicle. A bright and shiny car not only looks good, it attracts more buyers and better offers. Detailing your new purchase enhances its look and creates an expectation for you to want to maintain that look for as long as you own the vehicle. We are in the business of detailing cars. 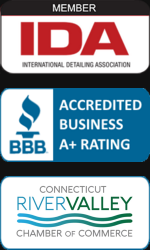 We have an extensive client list, providing diverse auto detailing services as well as a reputation for quality, and innovation. The business is the culmination of a dream to build a business ever since graduating from UCONN in 2003 with a degree in marketing and advertising. We are dedicated to providing superior customer service for your car detailing needs. My brother has been thinking about getting a car and didn’t know how often it should be detailed. It’s good to know that he could do it in the winter, especially if it can help remove grime and dirt that has accumulated. It sounds like it should be done before the temperatures really drop and the dirt doesn’t stick or freeze on it. My car has gotten really dirty from this winter, so I am thinking about getting it detailed soon. I like that you mention how early mornings are the ideal time to detail your car because the sun isn’t out. I might have to find a cool morning and try getting my car cleaned and waxed then.